The imperial law which forbade Christians to study Greek literature, rendered the two Apollinares of whom we have above spoken, much more distinguished than before. For both being skilled in polite learning, the father as a grammarian, and the son as a rhetorician, they made themselves serviceable to the Christians at this crisis. For the former, as a grammarian, composed a grammar consistent with the Christian faith: he also translated the Books of Moses into heroic verse; and paraphrased all the historical books of the Old Testament, putting them partly into dactylic measure, and partly reducing them to the form of dramatic tragedy. He purposely employed all kinds of verse, that no form of expression peculiar to the Greek language might be unknown or unheard of among Christians. The younger Apollinaris, who was well trained in eloquence, expounded the gospels and apostolic doctrines in the way of dialogue, as Plato among the Greeks had done. Thus showing themselves useful to the Christian cause they overcame the subtlety of the emperor through their own labors. But Divine Providence was more potent than either their labors, or the craft of the emperor: for not long afterwards, in the manner we shall hereafter explain, the law became wholly inoperative; and the works of these men are now of no greater importance, than if they had never been written. But perhaps some one will vigorously reply saying: 'On what grounds do you affirm that both these things were effected by the providence of God? That the emperor's sudden death was very advantageous to Christianity is indeed evident: but surely the rejection of the Christian compositions of the two Apollinares, and the Christians beginning afresh to imbue their minds with the philosophy of the heathens, this works out no benefit to Christianity, for pagan philosophy teaches Polytheism, and is injurious to the promotion of true religion.' This objection I shall meet with such considerations as at present occur to me. 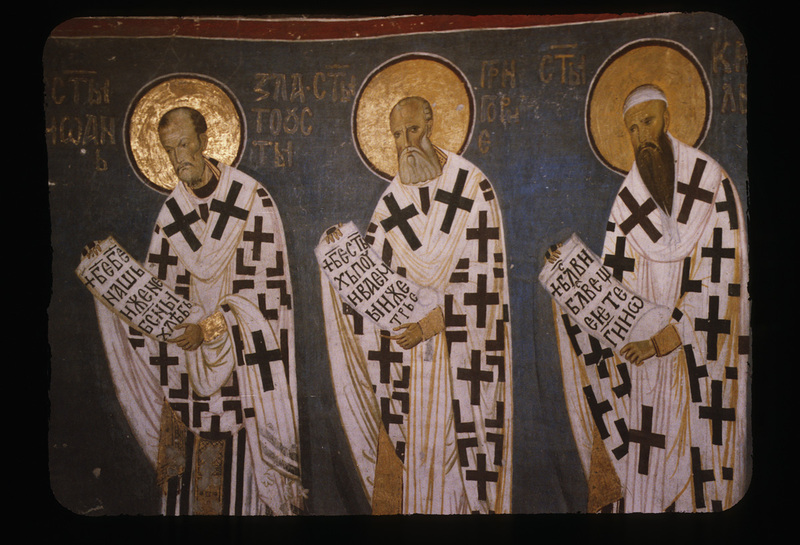 Greek literature certainly was never recognized either by Christ or his Apostles as divinely inspired, nor on the other hand was it wholly rejected as pernicious. And this they did, I conceive, not inconsiderately. For there were many philosophers among the Greeks who were not far from the knowledge of God; and in fact these being disciplined by logical science, strenuously opposed the Epicureans and other contentious Sophists who denied Divine Providence, confuting their ignorance. And for these reasons they have become useful to all lovers of real piety: nevertheless they themselves were not acquainted with the Head of true religion, being ignorant of the mystery of Christ which 'had been hidden from generations and ages.' (Colossians 1:26) And that this was so, the Apostle in his epistle to the Romans thus declares: 'For the wrath of God is revealed from heaven against all ungodliness and unrighteousness of men, who hold the truth in unrighteousness. Because that which may be known of God is manifest in them; for God has shown it unto them. For the invisible things of him from the creation of the world are clearly seen, being understood by the things that are made, even his eternal power and Godhead, that they may be without excuse; because that when they knew God, they glorified him not as God.' (Romans 1:18-21) From these words it appears that they had the knowledge of truth, which God had manifested to them; but were guilty on this account, that when they knew God, they glorified him not as God. Wherefore by not forbidding the study of the learned works of the Greeks, they left it to the discretion of those who wished to do so. This is our first argument in defense of the position we took. Another may be thus put. The divinely inspired Scriptures undoubtedly inculcate doctrines that are both admirable in themselves, and heavenly in their character: they also eminently tend to produce piety and integrity of life in those who are guided by their precepts, pointing out a walk of faith which is highly approved of God. But they do not instruct us in the art of reasoning, by means of which we may be enabled successfully to resist those who oppose the truth. Besides adversaries are most easily foiled, when we can use their own weapons against them. But this power was not supplied to Christians by the writings of the Apollinares. Julian had this in mind when he by law prohibited Christians from being educated in Greek literature, for he knew very well that the fables it contains would expose the whole pagan system, of which he had become the champion to ridicule and contempt. Even Socrates, the most celebrated of their philosophers, despised these absurdities, and was condemned on account of it, as if he had attempted to violate the sanctity of their deities. Moreover, both Christ and his Apostle enjoin us 'to become discriminating money-changers,' so that we might 'prove all things, and hold fast that which is good,' (1 Thessalonians 5:21) directing us also to 'beware lest any one should corrupt us through philosophy and vain deceit.' (Colossians 2:8) But this we cannot do, unless we possess ourselves of the weapons of our adversaries: taking care that in making this acquisition we do not adopt their sentiments, but testing them, reject the evil, but retain all that is good and true: for good wherever it is found, is a property of truth. Should any one imagine that in making these assertions we wrest the Scriptures from their legitimate construction, let it be remembered that the Apostle not only does not forbid our being instructed in Greek learning, but that he himself seems by no means to have neglected it, inasmuch as he knows many of the sayings of the Greeks. Whence did he get the saying, 'The Cretans are always liars, evil beasts, slow-bellies,' (Titus 1:12) but from a perusal of The Oracles of Epimenides, the Cretan Initiator? Or how would he have known this, 'For we are also his offspring,' (Acts 17:28) had he not been acquainted with The Phenomena of Aratus the astronomer? Again this sentence, 'Evil communications corrupt good manners,' (1 Corinthians 15:33) is a sufficient proof that he was conversant with the tragedies of Euripides. But what need is there of enlarging on this point? It is well known that in ancient times the Doctors of the Church by unhindered usage were accustomed to exercise themselves in the learning of the Greeks, until they had reached an advanced age: this they did with a view to improve themselves in eloquence and to strengthen and polish their mind, and at the same time to enable them to refute the errors of the heathen. Let these remarks be sufficient in the subject suggested by the two Apollinares. Julian forbade the children of Christians from frequenting the public schools, and from being instructed in the writings of the Greek poets and authors. He entertained great resentment against Apollinaris the Syrian, a man of manifold knowledge and philological attainments, against Basil and Gregory, natives of Cappadocia, the most celebrated orators of the time, and against other learned and eloquent men, of whom some were attached to the Nicene doctrines, and others to the dogmas of Arius. His sole motive for excluding the children of Christian parents from instruction in the learning of the Greeks, was because he considered such studies conducive to the acquisition of argumentative and persuasive power. Apollinaris, therefore, employed his great learning and ingenuity in the production of a heroic epic on the antiquities of the Hebrews to the reign of Saul, as a substitute for the poem of Homer. He divided this work into twenty-four parts, to each of which he appended the name of one of the letters of the Greek alphabet, according to their number and order. He also wrote comedies in imitation of Menander, tragedies resembling those of Euripides, and odes on the model of Pindar. In short, taking themes of the entire circle of knowledge from the Scriptures, he produced within a very brief space of time, a set of works which in manner, expression, character, and arrangement are well approved as similar to the Greek literatures and which were equal in number and in force. Were it not for the extreme partiality with which the productions of antiquity are regarded, I doubt not but that the writings of Apollinaris would be held in as much estimation as those of the ancients. The comprehensiveness of his intellect is more especially to be admired; for he excelled in every branch of literature, whereas ancient writers were proficient only in one. He wrote a very remarkable work titled The Truth against the emperor and the pagan philosophers, in which he clearly proved, without any appeal to the authority of Scripture, that they were far from having attained right opinions of God. The emperor, for the purpose of casting ridicule on works of this nature, wrote to the bishops in the following words: "I have read, I have understood, and I have condemned." To this they sent the following reply, "You have read, but you have not understood; for, had you understood, you would not have condemned."